With the growing demand for housing, increasing industry resource constraints and the rising level of public and private investment in social and private homes, there is a significant opportunity for both to become the leaders in the use of modular construction for housing, student accommodation and hotels. These sectors are an important part of BAM’s current output. Both businesses plan to accelerate home building activity in social housing and PPP contracts as well as in private developments in large population centres. This further development in its modular approach, reflecting the change in the industry and in line with BAM’s strategy Building the Present, Creating the Future, enables BAM to offer its clients added value through high quality and rapid programmes. The benefit of off-site fabrication is a significantly faster build time than traditional construction. Following BAM’s investment MHI will further increase its production capacity in Ballyjamesduff. BAM will also bring the expertise and experience which will enable MHI to bid for larger projects. This step also allows MHI access to BAM’s modular expertise in the Netherlands, where BAM Modulair Bouwen en Ontwikkelen has state-of-the art production facilities in Veenendaal to develop innovative elements for new-build and renovation projects in both the residential and non-residential markets, thus contributing to making buildings more sustainable and circular. Confirming the investment BAM Ireland CEO Theo Cullinane said: “This is a significant strategic investment for BAM. We are cognisant of the need for an acceleration of output in the housing sector and we are happy that our investment will play a part in the solution to the current housing crisis in the country. Modular is clearly the future and this is a unique opportunity to further develop a business, not just in housing but in modular housing which aligns closely with our drive towards ‘digital construction”. 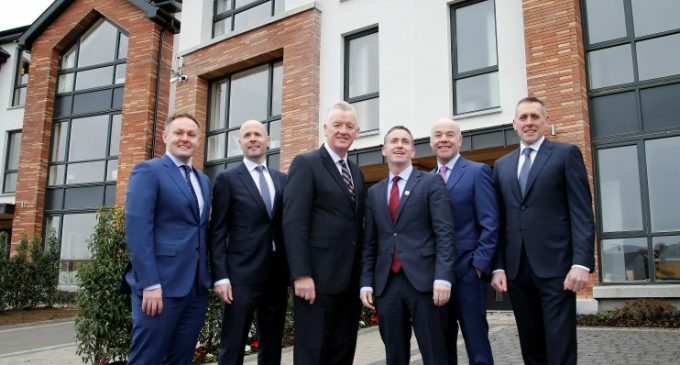 Pictured are: Brendan McNally, Executive Director & Co-Founder, MHI; Stephen McManmon, Joint MD & Co-Founder, MHI; Theo Cullinane, CEO, BAM; Minister of State for Housing and Urban Development Damien English TD; Chris Curtis, Joint MD & Co-Founder, MHI; and Adrian McNally, Executive Director & Co-Founder, MHI.